Some of the winners of 2018 writing awards, with RIT College of Liberal Arts Dean James Winebrake (front, left). Rochester Institute of Technology’s College of Liberal Arts honored student achievement in writing on Friday with the presentation of more than a dozen writing awards for essays varying from marijuana use and IQ, Ross Geller’s role in the television show Friends, and xenotransplantation. 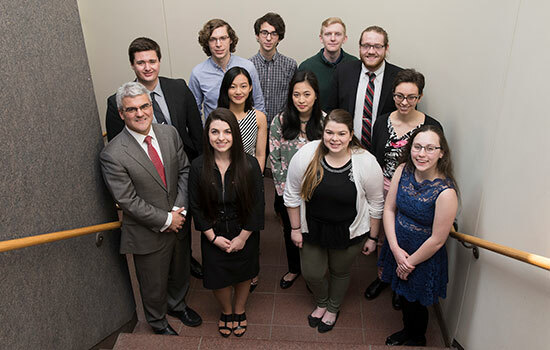 Faculty committees in each department within the College of Liberal Arts selected student awardees from a variety of disciplines whose work embodies the ideals and standards of excellence, creative endeavor and scholarship. The awards include the Henry and Mary Kearse Writing Award, created in 1980 thanks to a donation from Henry J. Kearse, founder and president of the construction firm H.J. Kearse Inc., and his wife, Mary, a longtime member of RIT’s Nathaniel Rochester Society. McCullough also won the first Mary L. Sullivan Award for her essay, “Defining DH: Intersectionality in the Digital Humanities.” The award was named for Mary Sullivan, who was dean of the College of Liberal Arts from 1977 to 1987.